Windows 10 users can run web searches using Cortana, something that was not possible in previous versions of the operating sytem. While Windows users may disable the web search functionality on Windows 10, it is enabled by default and will use Bing and Microsoft Edge for that. Web Search on Windows 10 works by querying Microsoft's Bing search engine when searches are made on the operating system. Results are offered as web links which, when selected, open in the Microsoft Edge browser. These searches may use your location or other information for a personalized experience, or simply open a results page on Bing instead. Examples that Microsoft provides to highlight web search on Windows 10 include searching for Pizza Hut to get the closest store next to you, or searching for Best Buy to get coupons for the site. Depending on how the operating system and browsers are used, the search option may improve how users search for content on the Internet. I make no use of it as I prefer to search directly in web browsers that are open anyway. Programs like Google Chrome or Mozilla Firefox could take over the search functionality on Windows 10 up until now. This would deliver results from the browser's search engine instead which could be any search engine and not just Bing. Additionally, and that is probably the main reason why companies like Google or Mozilla added the option, results were opened in the third-party browser and not Microsoft Edge. This, according to Microsoft, is no longer possible with today's change. Microsoft's reason for doing so is that the changing of the search provider and browser compromises the search experience on the operating system. Unfortunately, as Windows 10 has grown in adoption and usage, we have seen some software programs circumvent the design of Windows 10 and redirect you to search providers that were not designed to work with Cortana. The result is a compromised experience that is less reliable and predictable. The continuity of these types of task completion scenarios is disrupted if Cortana can’t depend on Bing as the search provider and Microsoft Edge as the browser. The only way we can confidently deliver this personalized, end-to-end search experience is through the integration of Cortana, Microsoft Edge and Bing – all designed to do more for you. Windows 10 users are limited to using Bing and Microsoft Edge when using Cortana's web search functionality. A side effect of this is that it will boost Microsoft Edge and Bing as users don't have any other option anymore when it comes to web searches on the Windows 10 operating system. Some might even argue that this is the main reason for Microsoft's decision to block third-party search engines and browsers from hijacking Cortana's search functionality. The change does not affect the default browser or search engine used by that browser on the other hand as Microsoft notes. Microsoft made the decision to limit the web search functionality on the Windows 10 operating system to Bing and Microsoft Edge. I personally can kind of understand in regards to using bing because they probably set up a specific bing api for cortana, but it’s not like they couldn’t release it for other search engines. I dont like the fact that it requires edge though. I mean COME ON! it should go to your default browser regardless what it is. It’s not like they couldn’t have Bing and Edge as the default so most people use those while still allowing people who know that changing the defaults comes with consequences, allowing those people to choose for themselves. Cortana works just fine with Chrome and Google – any commands that are built in are handled by cortana, any others are directed to Chrome and Google. if anything this change reduces functionality. Just say “set an alarm for ten minutes” and that works fine. I can understand MS reasoning behind this, after all Apple has been thinking like that for years. What is happening to the USERS freedom of choice here ??!! Get ready for yet more third party software releases to thwart Win 10 settings, particularly the intrusive Cortana. Should I ever install Windows 10 — never say never — it would be with the precaution of avoiding in the install procedure Cortana as well as the Microsoft account. Look what this leads to : imprisonment, aka “a better user experience”. The very fact a decision is made mandatory, coercive shows the weakness of the decider. “If you can’t beat them, join them” forgot an alternative: “avoid them”. Never say never? Well I do. NEVER! I didn’t actually delete Cortana, but I banished it from the start menu and never use it. I search with Google and browse with Firefox, under Windows 10, and it works OK so far. However, I avoid Windows whenever possible. By preference, I use Ubuntu (a common Linux distribution), which doesn’t do anything behind users backs. Linux is open-source, meaning anyone who understands C can read the source code and see how the system it works, almost literally down to the bit. Windows source code isn’t available to average users, so we don’t know what kind of spyware Big Brother Microsoft has watching us whenever a Windows computer is running. will this be the second round of this? Where are all the people that called others tinfoil hat wearing loons and said it would never happen when they were warned about how Microsoft wants to lock down Windows 10? Step by tiny step Microsoft is making changes to the way Windows works and in the future people will look back and wonder how we got here, how Windows ended up as a closed off ecosystem that only allows Microsoft Store apps to run, that only allows the use of Microsoft services, that forces the end-users into Microsoft’s way of doing things. Left microsoft for good a month ago in favor of ubuntu linux. fast and systemsettings oh so easy and logical to figure out compared with the jungle of windows. it too has privacy issues but unlike windows transparent and easy to disable. Yep, I find that one of the greatest things about Linux is that there aren’t a bunch of businesses fighting over you, constantly trying to get you to change the home page, or the search engine, or the browser, or the photo viewer, or get you to install some browser toolbar. On Windows, things are really getting bad. You can’t even install a DirectX update now without it trying to push Bing on you. One would expect better behavior from Microsoft. Microsoft should not behave like a tiny shareware peddler. If I remember correctly, back in the days of the “browser wars”, Microsoft was sued by the EU under anti-trust laws for trying to leverage Windows to monopolize the market with IE as the default for new users instead of clearly offering a choice of different browsers. Is this situation not exactly the same but worse? Instead of having a “voluntary but hidden” default setting, now they have made the search engine “mandatory” to a Microsoft web ad based-profit service. Should we be expecting another anti-trust suit in the near future or have people become sheep and just roll over like we’ve done with privacy issues? It’s strange how the same evils get repeated through history just because they either forget, don’t care, or think they can get away with it this time. Sorry to say but it’s very unlikely that the EU will take Microsoft to task over this, or anything Windows 10 related. When Microsoft got sued by the EU under anti-trust laws Windows had over 90% market share of all Internet capable devices, since then the share of desktops has dropped from 98% down to 55% so it can now be argued that Microsoft no longer hold a monopoly, the market is split between desktops with mainly Windows installed and mobile devices with Android and iOS. It’s also worth noting that it took over a decade from the initial complaint to the final judgment and even then a “technical” error caused the browser choice screen to go missing for 14 months after Windows 7 SP1 was released, something Microsoft were eventually fined a paltry €561 million, less than 1% of it’s profits that year. @Duckeenie, The “desktop” part is key here, when the anti-trust case was brought against Microsoft desktop devices were used by 90% of ALL internet connected devices and within that 90% Microsoft had a 90% share, in other words the overwhelming percentage of devices that connected to the Internet were Windows, today though desktop devices only account for 50% of all Internet connected devices. Microsoft has only 15% of total market share of OS connected devices, and falling. In last year alone smartphones has sold (1.5B) more than Microsoft’s total base of Windows users after in 31 years. @ilev, I’m not sure where you got 15% from, would be interested to know though as Statcounter, when looking at what they class as desktop, mobile, tablet, and console, they show desktop’s with a 55% market share and in turn Windows has around 90% share of that 55%. That was my first thought as well. And that time it did make sense indeed. . Not everyone reads and understands sites like this one, so the EU still does have the same responsibility in protecting its citizens. 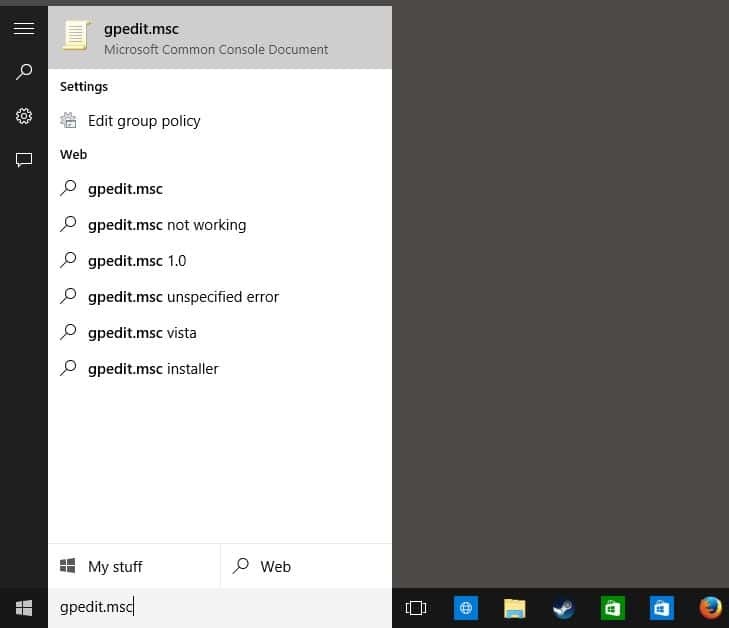 This isn’t some covert special team, this is simply “the plan” for Windows 10. This is why they gave it away for “free” to 7 and 8.1 users. They have this plan in place to monetize the OS, which includes the Windows Store (and UWP), as well as funneling users into Bing search, Edge, OneDrive, Office 365, etc etc. They have a ton of products they are hoping will make them money, and they’re using Win 10 as the bait, and the platform to serve up those products. It wouldn’t make any sense (given their plan) to easily allow users to switch off these money makers. You might be able to do so, but they aren’t going to make it easy. Microsoft’s reason for doing so is that the changing of the search provider and browser compromises their ability to make money. But seriously, who would want to use Cortana anyway? Wait… If I’m understanding this article correctly, this is only about Cortana, right? So if you’re not using Cortana, it wouldn’t matter? It is also instantiated when you hit the Windows key on the keyboard then start typing in the little search box at the bottom of the screen. When we press Enter to begin the search, it is at that point that Edge opens. So unfortunately, it is more than just Cortana. This little piece of unwanted technological progress appeared with my Windows update last night. Sighhhhh…..
BTW my Linux can’t hear me at all. I prefer that it stay a one sided conversation. If not for the aforementioned game I would have no use for Windows now and the reasons for me to upgrade to 10 are rapidly diminishing from the things MS keeps doing. If ever a software company wanted lessons in what to do to LOSE part of their user base take lessons here. I may ride 7 till it dies and then be Windows free the rest of my life. If not for all the Android kiddies not getting their head out of their phone long enough to realize what’s happening in the world much less with the MS entity they rarely use on their PC we wouldn’t be seeing all this crap from MS now. They intend to make $ off ads folks just like Android. I had that fear when it came out that 10 would be free. MS just wants to force you into it whether you want to go or not. I refuse. Why? If a user’s existing pc hardware fails… across US retailers, it’s becoming increasingly difficult to find new a pc _NOT_ preinstalled with windows10. Those are my “Top Two” guesses as to why. Related to the first point, it chafes me to continually see that new devices preinstalled with Ubuntu are MORE EXPENSIVE compared to identical hardware with win10 or android preinstalled. The BQ Aquaris ubuntu tablet is a recent example, priced at US$50 premium vs identical device with android preinstalled. WTF are they thinking? So buy a cheap netbook and install Ubuntu yourself. The OS is open source, so it’s free rather it comes with the hardware or not. The process is simple enough. Better yet, recycle an old computer as a Linux box, if you kept the outdated one after the latest upgrade. My Linux computer was made in 2005, and you know what, it still works! I’m not surprised at the change. But, in addition to the fact that Bing is a less effective search engine, it’s Microsoft’s assumptions that I want what they’ve decided is an “enriched” “experience” that offend me. How does Microsoft know that when I search for a restaurant that I always want to see a map of its location? How do they know that any time I search for a concert that I want to see the seats that are still available? More often than not these assumptions about what I want are going to be wrong. Not to mention that visibility in this “enriched experience” can easily be constrained to corporations that buy there way in. How long before a 3rd party adds back other browsers? Cortana is both the search engine of the OS and the non-mandatory personal assistant, the latter which relies on Bing to work. I believe Microsoft did this because Firefox and Chrome were actually hijacking the defaults without prompting the user. I haven’t installed either in a while so if anyone could confirm the preset behavior of these browsers, I would appreciate it. Thanks for the link back to the “How To Disable…” article. I find the web search irritating, as well. I’m perfectly capable of using a browser for a web search. If I’m typing something in the start menu box, it’s because I’m looking for a local file. This sounds more and more like Orwell’s 1984. Microsoft has become Big Brother. I will not use Cortana and will continue using Firefox and Google Search. Orwell’s vision is indeed happening, but not from Microsoft, they’re just trying to increase ad revenues. Big Brother is happening in our governments, slowly but surely, as citizens are all too happy to trade privacy for so called “security”. If MS, Google, etc play a role, it will be in providing information to the gov’t. At last, F I N A L L Y, I am convinced about Redmond … full of useless jerks reducing jobless numbers! MS is gradually becoming a laughing stock, jokes abound. Win 10/NSA OS is practically telling the software community to ditch them for Linux. A very welcome step of MS-NSA. It seems every new feature for Windows makes DOS look more and more attractive. MS-DOS or concurrent DR-DOS ? At v6.x they were virtually identical anyway. Nothing after v6.x is relevant. I am just curious, can you configure Google Now to use Bing as default search engine. Do not use Google Now, but just wondering if it automatically opens in Chrome and uses Google for its searches? Ya aka blocking free speech.. sign here on ghacks for the ultimate lawsuit. I can’t wait for MS to force it we’re going back to the IE suit of the old days and considering MS wants to sue the states MS is gonna get rapped and ya this will end up NSA OS but at least one evil will be dead and the world will deal with the rest. Analysts, Programmers and Coders, to your coffee mugs and keyboards! Mister Nadella, one word for your Windows: FAIL. You have until 2020 to turn the ship around. Signed: your soon to be unfaithful customer. I can’t imagine why anyone would use Cortana anyway. It was the first thing I disabled when I installed Windows 10. I initially thought it was some kind of joke. It reminded me of that stupid thing that use to be in Office. Or do they still have that? No wonder I rarely use windows! Someone break out the garlic. The ABMers are out in force tonight. And give ti a week until a 3rd party figures out how to circumvent this, the sad thing is the lame excuse MS uses for stating why it is enforced – anyways to those who keep apologizing for MS, keep it up hopefully you start believing what you say eventually. While I’m still Windows PC user, I’m avoiding using Microsoft tools other than core wherever and whenever I’m not paid to use them. I’m still on Windows 7, I don’t use Explorer, I don’t use Internet Explorer, my phone is Android, and I don’t have plans to use Windows 10, Bing, Edge or Cortana (ever). Microsoft’s big mistake (on their behalf) was to not set it this way in the first place! I have switched to Mac, so I don’t have to worry about Microsoft’s “Control Freak” implementations! But, I still support Ghacks through Patreon and read the newsletter to stay informed. I think Microsoft’s “Mission”, should be reevaluated!!! The only time I use my Windows computer’s, is when I program my Digital Trunking Radio Scanner’s! My Toshiba L855 won’t function at all when I have D-vasive Plus for PC installed! WTF! One other thing, I performed a search query using Google, and a pop-up indicated that my query was of”Malicious Content”. Huh!!! My computer has factory installed windows 10. I disabled cortana and EDGE on setup. I have l tried EDGE a couple of times; It is great if you enjoy seeing lots of ads and not having any extensions . It is the perfect browser for the technically challenged. They have made it more difficult to change defaults on windows 10; but anyone above beginner user shouldn’t have too much of a problem. I do like the speed that W10 boots up and like any new system has a learning curve. I have since upgraded my 2 windows 7 machines to W10 also. Windows 10 isn’t going away, so learn to live with it or go to LINUX. Before doing any upgrades my sure you printer has windows 10 drivers available. CANON got me twice on this,When I upgraded from XP an W7, they aren’t interested in supporting older printers, just selling new ones. What a MESS! Microsoft Windows 10 reminds me of the times of the Gulag.